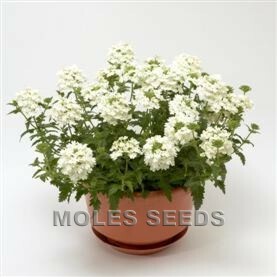 This series has a spreading mounding habit and is ideal for use in a single crop or combination baskets. Plants are very well branched and require no pinching. A very good performer. Annual, 3 weeks at 18-25°C, seed is sensitive to high moisture and should be covered with almost dry compost and kept in the dark. Sowing to flowering 12-14 weeks. 370 seeds per gram. End Use: borders, containers, baskets. Sow thinly April-July 18-20°C, cover seed lightly with vermiculite.